Did yesterday’s election affect nonprofit organizations? If you voted in Texas yesterday, you saw a proposed constitutional amendment on your ballot addressing certain organizations’ ability and qualifications to hold charitable raffles. If your organization has ever conducted or plans to conduct a raffle to raise funds, are you well-versed in the law? When I ask people if their raffle complies with Texas law, the most common response is, “There’s a law?” Now, I am not a lawyer, but I have spent quite some time researching the Texas laws that address gambling for fundraising whether a raffle, bingo, casino night, or poker. 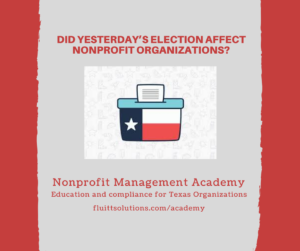 To learn more about the impact of Texas law on your fundraising efforts, attend the Nonprofit Management Academy—a two-day workshop about your role and responsibilities as a board member or volunteer. This is an excellent training program for parents from youth sports to band boosters, dance team to chess club. Or perhaps you participate in a local civic club, social service agency, museum, local historical society, or a performing arts group. The Nonprofit Management Academy is designed to help you understand your job as a volunteer board member as well as Texas state and IRS compliance for nonprofit, tax-exempt, and 501(c)(3) organizations. Academies are scheduled for December and January in Pearland and Katy, Texas. Seating is limited so register today at https://www.fluittsolutions.com/academy.